It's the ultimate film event for all oceanlovers! The Int. OCEAN FILM TOUR sets sail for the tour's forth voyage in march 2019. 120 minutes packed with the most inspiring stories from the seven seas and the best water sports action of the year. Born on the island of La Réunion, Julie Gautier grew up as a child of the ocean. Free diving and spearfishing became second nature to her but her passion lies in the creative process - as an award-winning film maker and a dancer. Fusing free diving and dance, Gautier leads us into a new territory of ocean life. JULIE is Gautier’s powerful story of finding her creative voice beneath the surface. Laurent Ballesta, marine biologist and of the world’s most renowned wild life photographers takes us to the remote atoll of Fakarava in French Polynesia. There he has been studying the hunting behaviour of grey reef sharks in a unique ravine under water. 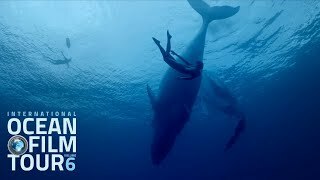 With unprecedented footage and spectacular scenes 700 SHARKS shows how fascinating and complex life under water really is and how big a role the moon plays in the oceanic ecosystem. The illegal fishing trawler “Thunder” was been making dirty millions for ten years – right until the ocean activists of Sea Shepherd caught sight of it. CHASING THE THUNDER is the gripping account of an ocean adventure with a higher purpose, illustrating how much dedication and grit is necessary to protect our oceans and what a group of persistent individuals can achieve. In KISSED BY GOD, we meet one of surfing’s all-time greats, a man who would change the sport forever but never managed to escape his own worst enemy in life and on the board—himself. A sober SURFER DAN introduces us to his drug and remedy, proving that a real surfer needs no palm trees, no tan lines, and—most importantly—no excuses. Two music aficionados sail the world and start to listen: In four and a half years Hannes and Ben call at ports in 31 countries. Their goal is to record as many local musicians as they can and connect all of them through music.